Salvador Perez: Top-Tier Fantasy Catcher? The probable answer in any league, and even more so in a Dynasty league, should be Kansas City Royals backstop, Salvador Perez. His numbers since August 1 are within reach of Mike Trout (338/505/566; 8 doubles and 7 home runs) for a standard 5×5 league. Perez, who turned 23 in May, has largely flown under the radar since the Royals signed him out of Venezuela back in 2006 for $65,000. Aggressively assigned to the Rookie-level AZL Royals in 2007 shortly after his 18th birthday, Perez held his own, hitting 244/320/279 in 30 games. In 2008, Perez appeared in a total of 25 games not in the instructional league, hitting 361/409/482 for the Rookie-level Idaho Falls Chukars and Burlington Royals. After the season, Baseball America ranked Perez the #19 prospect in the Royals’ organization, and lauded his defensive abilities, naming him the best defensive catcher in the Royals’ system. Returning to Idaho Falls in 2009, Perez hit 309/357/421 in 59 games before being promoted to the Low-A Burlington Bees of the Midwest League, where he struggled, hitting 189/230/236. Prospect evaluators were not swayed, as Baseball America ranked Perez #20 in the Royals system, the #20 prospect in the Pioneer League, and the best defensive catcher in the Royals’ system. The Royals kept pushing Perez in 2010, and he responded with a great season, hitting 290/322/411 over 99 games for the Wilmington Blue Rocks of the High-A Carolina League. 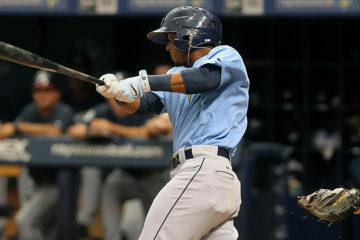 After the season, Baseball Prospectus ranked Perez #20 as well, noting that he was an “outstanding defender” who “made nice progress with his bat.” Baseball America ranked Perez the #17 prospect in the Royals’ system, as well as the best defensive catcher in the Carolina League and the Royals’ system. In 2011, Perez’s bat came alive, as he hit 283/329/427 in 79 games for the Northwest Arkansas Naturals, the Royals’ AA affiliate in the Texas League, before being promoted to the Omaha Storm Chasers, the Royals’ AAA affiliate in the PCL. In Omaha, Perez hit 333/347/500 in 12 games before being promoted to the majors. Perez kept hitting in the big leagues, putting up a 331/361/473 line. In his debut, Perez threw out two base runners, showing off his mechanics, footwork, and arm strength, all of which were universally lauded by scouts. After losing his rookie status, Perez graduated from the prospect lists, but he was ranked the 17th best prospect in the Texas League in 2011. Coming into the 2012 season, Perez was slated to be the starting catcher for the Royals. In late February, Perez signed a long-term contract with the Royals, buying out all three of his pre-arbitration years as well as two of his arbitration years. The Royals also hold team options for 2017, 2018, and 2019, giving Perez much-needed financial security in exchange for those seasons. During spring training, Perez tore the meniscus in his left knee, requiring him to have surgery and miss nearly half of the season. After a brief rehab stint in AAA, Perez returned to the majors, and continued to hit, putting up a 301/328/471 line, hitting 16 doubles and 11 home runs while playing in 76 games. In 2013, Perez got off to a slow start, and was hitting only 267/281/372 at the end of April, then struggled from the beginning of July through August 22, hitting 208/262/277 across 38 games (see, I didn’t cherry pick the dates for the stat lines in the beginning of the article). Perez has been hot over the past four weeks, hitting a BABIP-fueled 403/435/714 (BABIP of .391, as opposed to a career .316 BABIP) while trying to propel the Royals into the playoffs. What can we expect from Perez in the future? While he probably won’t have a peak season like Buster Posey’s MVP campaign in 2012, a consistent 300/340/480 with 15-20 home runs for the next five years is well within his reach, if even a bit understated. Additionally, Perez is best known for his glove, posting a +11 Defensive Runs Saved in 2013 and throwing out 34.9% of would-be base stealers, good for 5th highest in the majors in 2013. Perez’s defensive prowess, combined with being blocked at 1B, DH, and 3B for the foreseeable future means that he won’t be making a position change any time soon. While picking up some time at another position would keep his bat in the lineup more frequently and increase his fantasy value by increasing his positional flexibility, he already hits while playing a position that is perpetually shallow in talent. So go ahead, drop some franchise years on Salvador Perez and stop the catcher carousel. 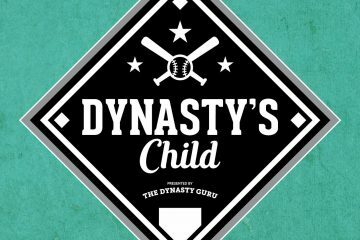 So for the last three spots on my dynasty league roster, who would you keep? SP is my greatest need so I’m leaning Mejia and Luebke… and maybe Pinto since Rosario might lose C eligibility after next year. Oberholtzer, Mejia, Luebke, Daniel Hudson, Ben Revere, Venable, Chris Johnson? One of these younger guys maybe: Burch Smith, Erik Johnson, Pinto, Ruf, Flores, Asche, Semien? Any chance Vic Black is the closer in NY next year? Thanks! Who is Lopez in this situation? I’d have a hard time recommending Mejia (though I like his talent a lot) for an SP need since he only threw about 50 IP last year. If you’re talking for the far out future, sure, but next year he probably won’t solve your problem. I don’t think Vic Black becomes the closer next year, though considering reliever volatility, I wouldn’t rule it out entirely. I assume you mean Perez instead of Lopez, and if you could get Perez for Rosario, I would do it in an instant. As for pitching, I’d probably let those players go. I like Chris Johnson, but his .401 BABIP (he was a high BABIP guy before, but 401 is extreme) makes me fear the regression. I agree with Craig about Vic Black. I think Parnell will be given the first shot, with Jeurys Familia getting a shot as well. Black has looked good, but his history of control issues would give him a short leash.